Page F30: When will we see photographs of 24 Themis? When will we see photographs of 24 Themis? Fairly typical for an object in the asteroid belt, 24 Themis orbits between Mars and Jupiter, ranging from 2.7 AU to 3.1 AU. 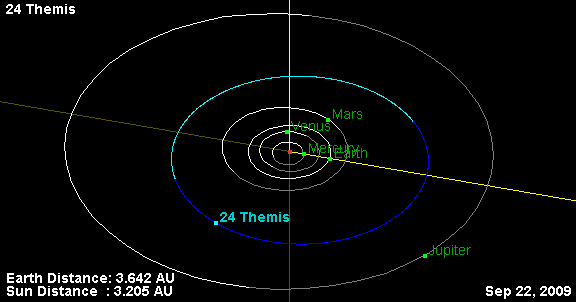 With the Earth at about 1 AU from the sun, that means that about the closest distance possible between us and Themis is 1.7 AU, and the farthest about 4.1 AU. How close has Themis been to us since its discovery? That is, have we had any good chances to observe it at a relatively close distance since we have found out about ice on its surface? From the time since we found out about ice on the surface until now, the distance from Earth to Themis has ranged from over 4 AU to 2.45 AU, just two months ago. The two bodies are once again becoming more distant, so we will have to wait until....the first week of December 2012! At that time they will be just 1.982 AU apart, nearly as close as the two can get. An even closer approach will happen in mid-March 2014 at 1.775 AU, then 1.771 AU in January 2019, and then nothing of note until 1.755 AU in March 2025. Just under 1.8 AU seems to be about as good as it gets with Themis. Wolfram Alpha has magnitudes for objects at different dates, and also provides an interesting comparison between 24 Themis at its current distance and at the next closest approach. Current distance: magnitude +12.24 (higher = dimmer), equivalent to a 100 watt bulb 8473 km away. At closest approach: magnitude +10.99, equivalent to a 100 watt bulb 4760 km away. This was taken in 2007, when Pallas never got closer than 2.2 AU. 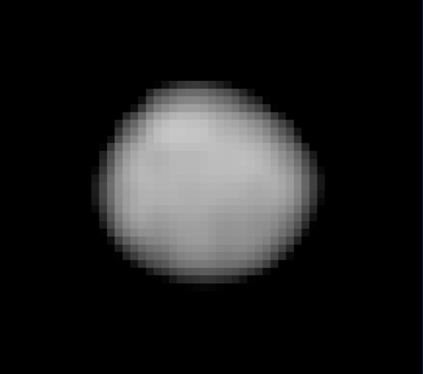 Pallas is some 550 km in diameter with an albedo of 0.159; Themis is 198 km in diameter with an albedo of 0.067.